This page is being updated and changed to try to focus more on Welch Mountain. A number of peakbaggers and contacted me on splitting the two pages. So I have made this page focus on the more visually dramatic Welch Mountain. Welch Mountain located just north of Campton, New Hampshire is one of the more popular summits around. The summit is actually mostly treeless and offers dramatic views that rival many mountains in the region tice it's size. Though very easy in terms of distance, the route up travels up near exposed rock slabs that offer excitement. 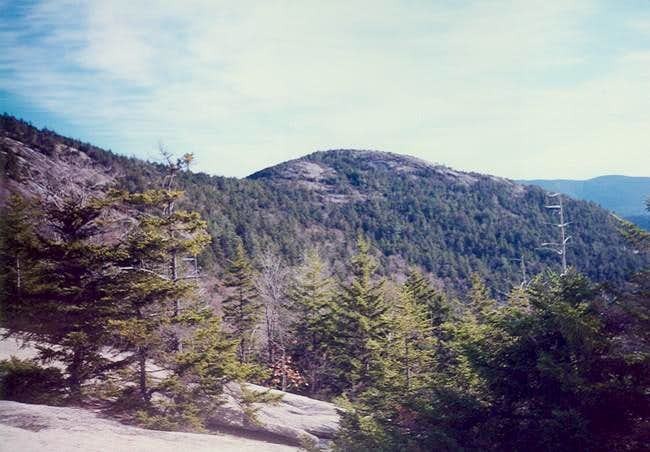 The peak can be combined with neighboring Dickey Mounatain via the Welch Dickey Trail. The Welch and Dickey combo is one the best known hikes in the western White Mountains, in spite of the mountains' small size. Their popularity comes from the fact that (1) the mountains are very close to the interstate, (2) it has a short (4.5 miles) but exciting loop hike consisting of hiking borderline class 2 ledges, and (3) more panoramas and open ledge exposure that many of the neighboring larger mountains. This hike is great for first time mountaineers because they can get the feeling of summiting a treeless mountaintop (not due to timberline) in less time and effort that it would to climb one of the larger summits such as Mt. Lafayette or Mt. Moosilauke. Views off to the south and west are classic with shots of Cardigan, and Sandwich Mountains. I prefer the view from the smaller Welch Mountain to the larger Dickey Mountain because of openness of the mountain. The Welch and Dickey trail is generally very safe in good weather conditions. However, due to numorous rock slabs and drop offs found on both mountains this hike is not recommended in wet or ice conditions. If you are thinking of hiking this mountain in winter, I would strongly advise bringing crampons. This mountain is a great mountain to hike from spring through fall. The best time to climb this peak to avoid the crowds is usually on a weekday in fall when there is a nice chill in the air, the leaves have changed and few people are out hiking. Some like to hike this mountain in early spring just before black fly season take full effect and while the snow is still melting off the higher peaks. If you climb this mountain in winter you must have the right gear. Crampons are nessesary due the large amount of ice on the steep rock slabs and the huge amount of drop offs. Hiking is not advised without crampons in winter. While the slabs are easy to hike in summer they can become dangerously icy in winter and without proper gear can result in serious injury. The rare jack pine grows on through the ledges of Mt. Welch. It is found only in areas where of steep, treeless slabs of rock or in an area where forest fire have destroyed competing trees and taken away the soil. Mt. Cardigan and Mt. Chocorua are the other two mountains with jack pines.